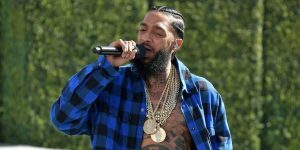 The American rap star was shot multiple times yesterday right in front of his store in Los Angeles. After being shot, the medics and the police quickly dashed to the place of the incident. Nippsey was seen being pressed on the chest and trying to be stabilised in order to get him more time to reach the hospital to be properly treated. All efforts to get Nippsey to survive the shot proved abortive as he later died. The Law Enforcements have commenced investigation already and it is being swiftly reported that the person who shot Nippsey is a black boy in his early 20s. It was reported that the boy shot Nipssey and two other people multiple times before jumping into a car that was already waiting for him which sped off immediately. There are also reports that it could be a rival gang who has pulled off the hit, but there is a twist in the whole drama as a certain man claimed responsibility for his death.